The alarm is due to ring in a few minutes after I look at it. I take a risk and press cancel. It is too warm, too dark, too nice to want to get up just yet. But I manage; dressing in the darkness, trying to be as quiet as possible. H, who must be one of the lightest sleepers in the history of western civilisation, rolls over, grins, waves at me and, pulling the covers over his head, rolls back. I step outside into still, star light silence. No wind, no rain, maybe just a few clouds behind the trees. I’d like to stand in the silence and listen to the forest waking, but I have an appointment with a man and a boat. The car alarm chirps, the lights flash, I drive away into a still dark morning. 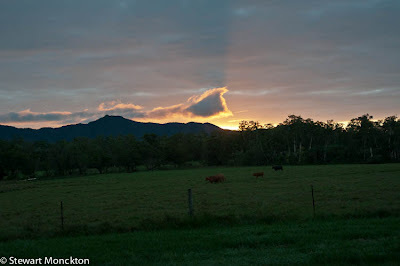 On the main road I drive a little further to the right than I would normally do, hoping it would give me a bit more reaction time if anything springs from the bushes – unwary cassowaries, over-confident wallabies, Barney. Night driving in places like this can be stressful as wildlife has the run of the road; bright eyes in the vegetation slow you down, dark shapes in the shadows make you brake. The first thing that slows me down is a set of traffic lights. In a rainforest? At five in the morning? When I seem to be the only person awake in all of Queensland? Time slows as I wait, but the lights go green (eventually). The sky lightens, the trees take on form beyond silhouette. As I reach the ferry a moth drifts across the headlights. Well it’s something I suppose - a moth, the last resort of the desperate. A noisy wave of water announces the arrival of the ferry. Nothing comes across from the other side, and nobody joins me on the trip back. Thin vapours of smoke steam rise from the water’s surface, the Welcome Swallows are still there. I think of Kangaroo Island and wonder if these are the same birds; winter migrants, sun chasers, sky swimmers. After a complete loop of Daintree village I find the jetty and the waiting boat. Remarkably the only other people on it are from Kangaroo Island. I explain that there were traffic lights – they look doubtful; I can understand why. Patches of winter mist drift over the river; there is not a breath of wind. Perfect reflections are only broken by the movement of our boat. We swap seats, Matilda waltzes to the other side of the boat, buries her head in her jacket so that only her eyes and forehead show. As a body language statement it’s the perfect expression of boredom, cold and early morning resignation. A Shining Flycatcher, satin blue black, dances on the low branches. As the light grows and the mist fades a new world comes into view. For once this does look like the pictures in the brochures, with no rain, and in the background hills cloaked in trees, rather than clouds. When the engine stops there is hardly any noise at all; the gentle slap of the bow of the boat as it drifts through the water, the distant call of cockatoos, the croaks of hidden frogs. Birds are a little thin on the ground, but beauty is spread thickly, like the double sweep of butter on the best breakfast toast you can imagine. The river mirrors the sky and the trees, silver toned and silent. A many stemmed tree joins the sky to the Earth. With perfect symmetry it is reflected in the river and is framed by larger trees – you could stand on your head and the scene would remain unchanged. The mist that drifts over the river beams the rising sun, the light bursts through bank-side trees and points at our boat. It really is a picture perfect morning. With a petroleum cough the engine starts to run and we move towards backwaters and side streams. Forest Kingfishers dive to wash from a leaf bare branch. A group, maybe a family, of blue winged kookaburras - looking like the grumpy cousin of their more widespread relatives – sit in the tree tops with a fading Moon behind. Our guide and boatman apologises for the lack of activity and I almost choke – I’m already approaching sensory overload. The rain washed air and the morning light give the whole scene a crystal clarity. It’s so clear I imagine you could see the knees of bees, the feet of ants and each and every one of well preened feather barbs on the passing birds. I need a pause to catch my mental breath, a coffee – better still, two – would be good. It’s a remarkable morning – and we are only half way through it. A wall of fig trees reaches up away from the water; some are in flower and some are not. We wait to see what arrives, but very little does. Then the air behind us fills with birds; a large flock of White-Rumped Swiftlets has arrived. At the junction of two rivers they dash down to drink from the still river water, and at the junction of the air and the Earth they get the water they need. Birds swirl around us, a feathered vortex of movement and life, chitter-chatting to each other, but it’s another noise that catches the ear. It sounds like a tongue roll, or a thumb being drawn over a pack of tightly held cards, a ripple of sound made by the birds’ wings as they flutter dash past. Photography is almost impossible, but as I look around at the others on the boat I realise I must be smiling as much as they are. Serotonin levels climb to new heights, and I don’t get the mental break I thought I needed, but I don’t care. Any trace of mist has been burnt away by the Sun and the sky is clear blue. The swiftlets leave as quickly as they came, heading high to catch the insects drawn out by the first warm day of the week. For once, the sun on my neck is a novelty, my shirt sleeves creep up my arms and my thoughts move from coffee to water. Then the boat stands quickly on its nose, as close to an emergency stop as is possible to do in a boat with an outboard. (“When I drop my hand please bring the vehicle to a complete stop as quickly as possible”.) My arms are not all that the sun has drawn forth. 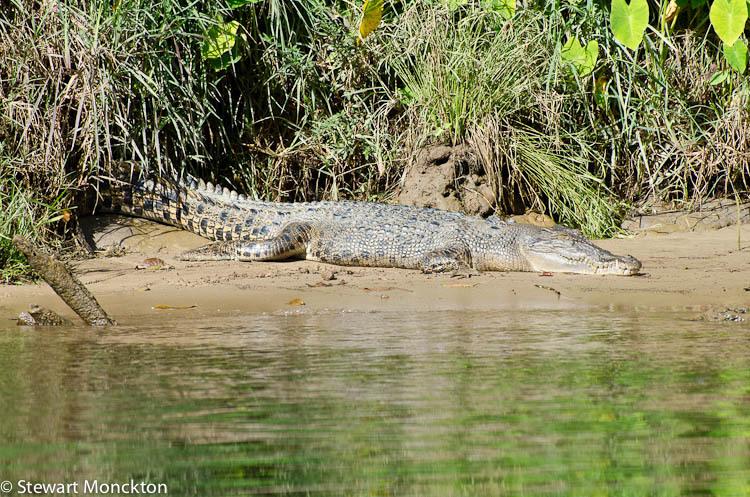 Lying on the exposed mud on the river bank is a large crocodile. I don’t know if it really is “large”, but it looks large to me! Slowly warming, sun soaked and huge, it takes a few mud splaying steps forward. Forward towards us. The distance and the metal of the boat offer a sense of security. But it still does not reduce the backbone thrill of seeing a large predator in the wild. Such animals are the ghosts of old memory, lurking in the grey learning of the past; now we could push a button, pull on a lever and be gone, but clearly that was not always the case. And seeing these animals is a reminder of how far we have come, but also how close we still are to being prey rather predator. On a branch reaching over the river another solar cell reptile is soaking up the rays. A Green Tree Snake wraps itself around the thin twigs, waiting. The sun brings out the birds as well, preening and basking in the novelty sun. As the sun climbs higher the boat turns and heads back towards the jetty. With each passing minute the colours become sharper, the light harder. The world blue-shifts towards morning, away from the dawn, a wind catches the water, the mirror cracks. A crocodile basks in full view of the jetty, where an English tourist fails to notice it. She is shocked when I point it out, claiming it’s a log. I drive back to the ferry, pass over the river, wait at the traffic lights and finally get a cup of coffee. In the late afternoon of the same day I pull up at the ferry again. This time the whole family is with me. Clouds have built during the day, the wind is a little stronger, the river changed from silvered blue to a darker grey green. It’s the same river, but it’s different. It looks larger, more inaccessible. But in the perverse nature of faded light the distance between the banks seems to have shrunk, the trees push in from the banks with longer fingers than the morning. 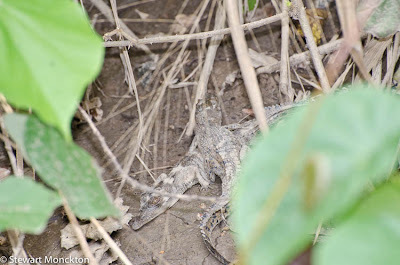 We move slowly away from the ferry and soon find crocodiles on the bank sides. One, a female, still has the young around her – small creatures tangled around each other, legs, scales, sharp teeth and mud. We drift through shifting backwaters, where branches hang lower and finger the water. At the point of an island where the slip stream and the main river join, Rainbow Bee-eaters dash out from their bare branch perches to catch the last of the days’ insects. These are birds of almost incandescent colour, paired with stunning speed and neck snapping agility. From our point of view they are remarkably beautiful; a twisting flash of living colour. But from an insect’s view they must be the very devil himself. A small spider falls from the branches into the boat and causes a disproportionate reaction. I glow with fatherly pride as the commotion is spawned by another family. P and I exchange knowing glances – I can tell she wants to ask “What’s all this fuss about?”, but with remarkable tact she holds her tongue. Flower heads, fallen from bankside plants drift in the current. Bright spots of colour drift round and round and round as they wash towards the sea. H trails his hand in the water. I mention crocodiles. He stops. 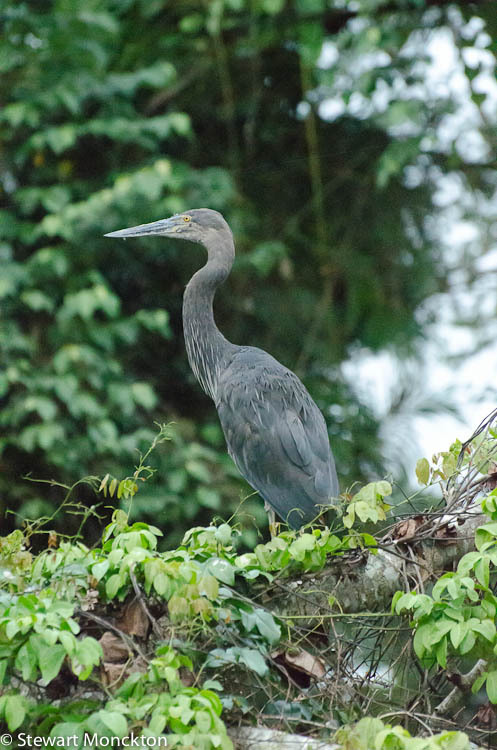 A Great Billed Heron – a rarity – power flaps up the river. We follow and find it perched in the tree tops. It stands there watching us watching it, an exchange of views in the evening. It stands about a meter tall, with a bill to match its scale and its name. It is classically shaped with a blue grey brown colour the combination of herons and bitterns. 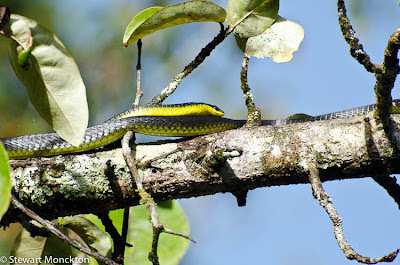 It walks slowly across the top of a dense bush, illuminated with lamp light and the lightening flicker of camera flashes. 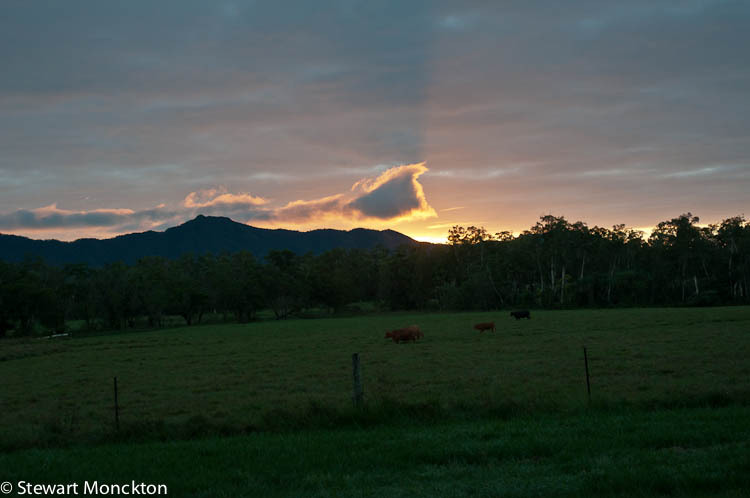 Eventually it flaps off, a dark shape cutting across the darker sky. We reach our turning point on the river, our high-water mark. Waiting for us, a promised surprise, is a roost of Cattle Egrets, hundreds, maybe thousands strong. 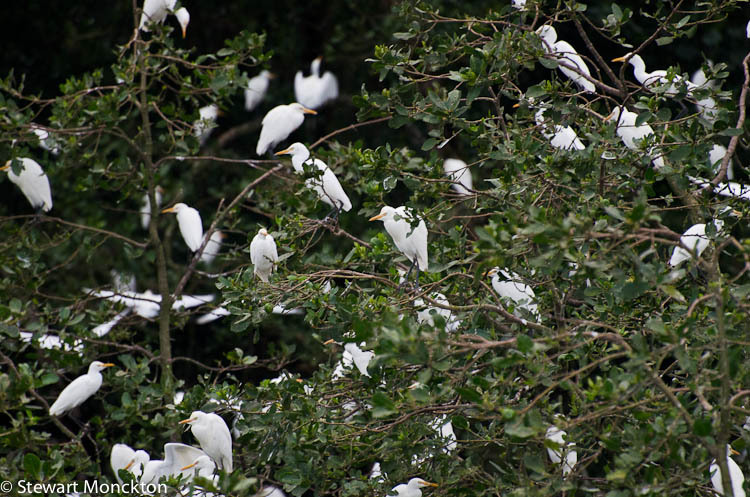 The trees are decked with birds, each branch has one or two snow white living baubles. Beaks and wings, necks and long legs. It’s an evening gathering that seems to mock the failing light at the day’s end; a gathering of 24 hours of lightness and energy into one. 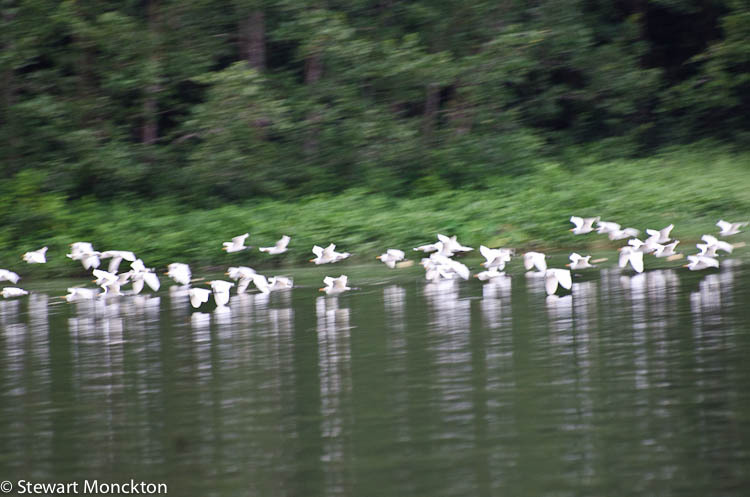 Down the river, where a side stream joins the main river the birds pour down the height of the tall trees, from canopy to river top in an avalanche of birds. 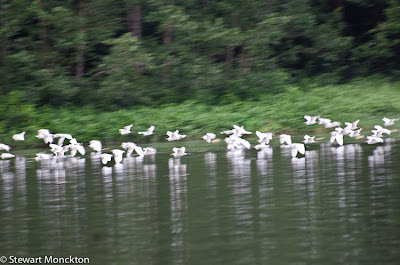 Maybe a hundred birds at a time slide down the face of the forest to meet the river. A white blanket of birds flashes up the river to join the roost, pulling the last rays of the day’s light with them. From flight to sleep, from day to night. You could easily see how you could build the story of the birds that gather the light to them, hide it in the trees until, after the long night they spread the light back over the land as they wake and go. The boat engine coughs into the life, and for one last minute the sky is filled with an illusion of white light. We follow the water downstream, back towards the sea, towards the next day. Stewart, you've got so many beautiful shots here, and so different frn the animals we see here in Ontario, Canada. Ahhh, lovely. I feel like I'm there. Fantastic photos and narrative! Love it. Wow, those pictures are so beautiful! I had never seen a Great Billed Heron before - do they look cute! Definitely great shots, Stewart! Stewart, what a wonderful trip report. I loved all the photos, scenic shots and the birds are all beautiful. My favorite are the bee-eaters and the egret tree. Awesome photos and post. Have a great day! It was worth the early rise Stewart .... SO peaceful and your captures are a delight especially that pretty little bird. Lovely photos and a great narrative. But, I find I keep scrolling back to the shot of the lone tree reflected in the lake. It is certainly speaking to me and I so love what it is saying. 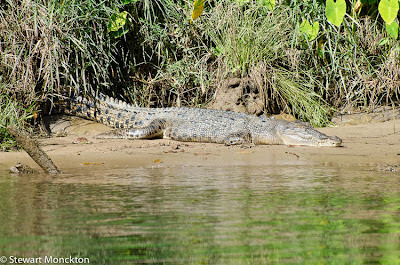 Sounds like your Daintree experience was very similar to ours 3 or 4 years ago - crocs and all!! It's certainly a magical experience, isn't it?! I have a real thing for tree silhouettes and solitary tree in a landscape. The ones here are fantastic. Love the fogginess of them. All beautiful shots, but the shadowy tree reflected in the water is just killer- WOW!